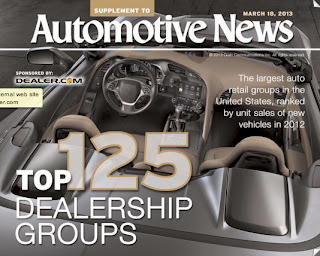 "Morgan Auto Group 2nd Biggest Mover in 2012 Top 125 Dealership Groups"
The Morgan Auto Group out of Tampa, FL has moved from #102 to #78 in the latest Automotive News Top 125 Dealer Group Survey of the United States. This placed MAG as the second biggest mover in the survey. Morgan Auto Group is a franchised new car dealership group representing over 10 different brands in the Gulf Coast and Central regions of Florida: Honda, Toyota, Scion, Lamborghini, BMW, Buick, GMC, Mitsubishi, MINI and Ford. The group posted new car sales of 9,854 units 7,074 used units respectively with a total of $554 Million Dollars in total dealership revenue. 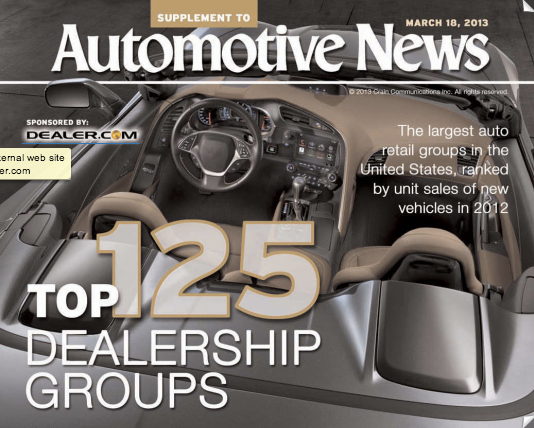 The group is relatively new the the Automotive landscape. Larry Morgan purchased his first store Toyota of Tampa Bay in 2005 and has brought the same rate of growth that made him an industry name as the former owner and CEO of Tires Plus. The group's most recent acquisition of volume dealership Brandon Honda and the opening of their open point MINI of Wesley Chapel store aided in their "mover" status for 2012. You can read more about Larry Morgan here in the Automotive News article "Larry Morgan built Tires Plus, now builds a dealership empire."